It is important to eat healthy and get the essential nutrients we need from our foods. 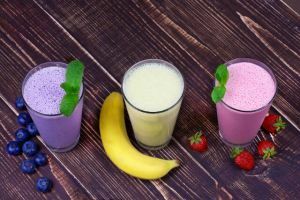 A smoothie is a great way to get them all, because you can take virtually any ingredient and whip it up in a yummy tasting drink. 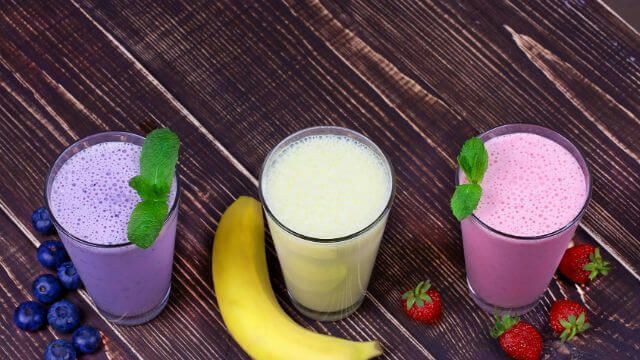 These smoothies are filled with ingredients to help boost your brain power. Combining them, in particular, may give you an edge with mental clarity, and memory, and may also work to improve your mood and keep your mind sharp. Coconut is low in natural sugars, and high in fiber, manganese, and medium-chain triglycerides, which are healthy fats that are easily used by the body for energy (and not stored as fat!) This smoothie provides instant and sustainable energy, as well as fuel for your brain. This smoothie has so many benefits for your brain. It is high in antioxidants, as well as essential omega-3 fatty acids, which are linked to boosting your brain power by improving memory and learning ability. Place all the ingredients into your high-speed blender and blend for approximately 30-45 seconds. Dopamine is a neurotransmitter involved in motivation, emotion, and pleasure, and it’s easily boosted by a healthy serving of protein. Chia seeds offer a good dose of protein, and fiber to keep your blood sugar steady. The small amount of espresso in this smoothie will help keep you focused, and provide antioxidants. This is a good smoothie for the days you need to get stuff done. Combine all the ingredients and blend on high speed until smooth. Both the pomegranate and strawberries in this smoothie provide important antioxidants, the flax seeds provide the essential omega-3s, and the yogurt gives you important probiotic benefits. This smoothie is also full of fiber, which helps to keep your blood sugar regulated, and your energy levels stable. Whisk the pomegranate juice and honey in a small cup to dissolve the honey completely. Combine the strawberries, yogurt, flax seeds, ice cubes, and pomegranate mixture in a blender. Blend until smooth. Cherries contain anthocyanins, which are linked to improving memory, and the green tea powder contains L-Theanine, a rare amino acid that is associated with promoting a state of well-being, alertness, and relaxation. Hey Buddy!, I found this information for you: "5 Brain Boosting Smoothie Recipes". Here is the website link: https://www.thealternativedaily.com/5-brain-boosting-smoothie-recipes/. Thank you.